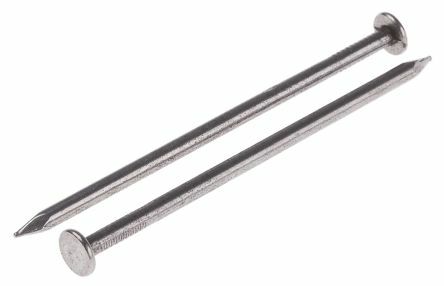 Nails are metal fastener with a sharp point at one end and a rounded flat head at the other end. Nails are used to join materials together (usually wood) and are driven into the material with a hammer or air nail gun. Nails are used in all types of applications. The most common use would be in carpentry where wood is joined to wood or another material. Other types of nails or tacks are used in construction, roofing, upholstery, and carpeting. Nails are available in different shank lengths and diameters, with galvanised Zinc plated or bright zinc plate finishes.